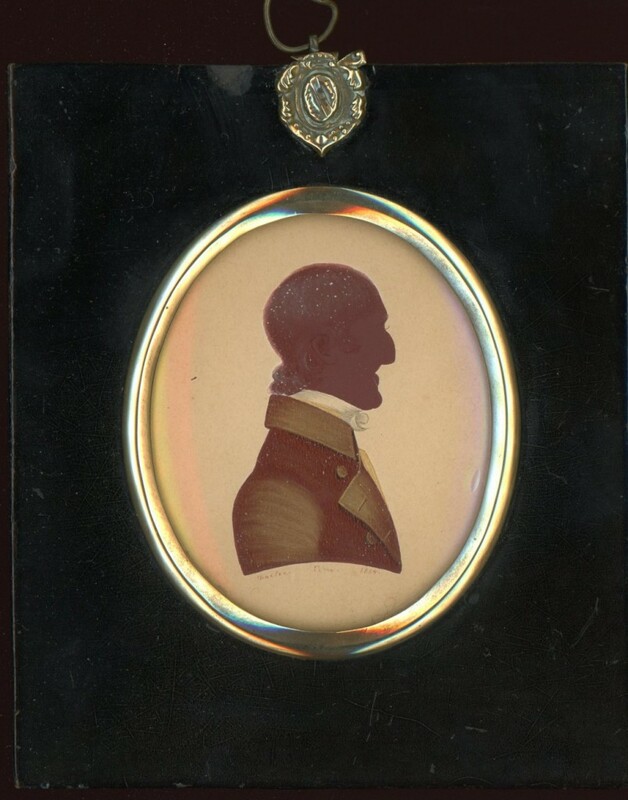 This is a silhouette portrait of an unknown gentleman with wispy hair, a prominent chin and a large hooked nose, the perfect subject for a silhouettist! He is wearing a double-breasted coat with deep-cut revers over a lemon waistcoat and white stock. The silhouette is painted and extensively gilded with a hint of colour. It is signed and dated under the bust-line ‘Foster Pinx. 1825’ and is set in a traditional papier-mâché frame with a brass surround and unusual shield-shaped hanger. The original hanging ring has been replaced. The son of a gentleman land-steward, Edward Foster joined the Derbyshire militia at an early age. Over the next 25 years he saw active service during the War of American Independence and then in Holland and Egypt. A few years after retiring from the army, Foster forged a new career in painting with early success that included Royal patronage which earned him his own apartment at Windsor Castle. By the 1820s he had returned home to Derby where he continued to run a successful portrait studio only retiring officially upon his 100th birthday. He was 102 years old when he died having been married five times with 17 children, only the youngest of whom outlived him.